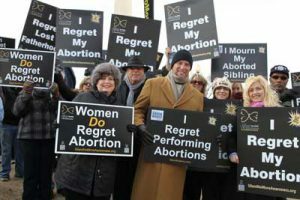 At the close of last year’s 2016 March for Life the women and men of the Silent No More Awareness Campaign gathered at the steps of the Supreme Court to share their testimonies of abortion loss and recovery. I have been blessed to participate in many Marches and Silent No More events over the years. Yet as we prepare to come together again this month in Washington D.C. and San Francisco, there was something special about last year’s gathering that continues to resonate within me. That afternoon and evening, as the snow began to blanket our nation’s capital, I saw the Shockwaves of Abortion Initiative of the Silent No More Awareness Campaign in a new and dynamic light. The Shockwaves of Abortion shines a bright light on the wider impact of abortion on our families, communities and nation. We know that the mother and the father of the child are at the “epicenter” of the abortion event. But the destructive shockwaves reverberate across our nation impacting all of us. Grandparents, family and friends can play an integral role in the abortion decision and procedure. They, along with the siblings of aborted children, are often intimately touched by that unborn child’s death. Like the mothers and fathers (and abortion providers,) they too can suffer from grief, shame and regret and may benefit from an emotional and spiritual healing of this loss. Last year at the Supreme Court former abortion doctor Anthony Levatino offered a moving witness of his conversion from an agent of death to a defender of the unborn. Mothers, fathers, grandparents, and siblings of aborted children shared their testimonies and stood side by side with Dr Levatino as they prayed for, and supported one another. The unique signs they carried and their testimonies created a dynamic visual presentation and a living, breathing narrative of this wider reality of how the Shockwaves of Abortion have impacted our society. It was also a beautiful witness to the power of God to bring faith, hope and life – out of sin, suffering and death. On January 21st 2017 the Silent No More Awareness Campaign will once again gather prior to the West Coast March for Life in San Francisco and on January 27th at the steps of the Supreme Court in Washington, D.C. at the close of the March for Life. The Participants will hold their powerful signs sharing with the world the truth about their abortion loss and regret, and through their testimonies, the destructive power of the Shockwaves of Abortion. Most importantly, you will be blessed to witness the mercy and healing power of God. I have been in pro life advocacy and ministry for abortion loss for over 20 years. Being part of the Shockwaves gathering in D.C. last year was one of the most powerful spiritual and emotional experiences in my many years of pro life outreach. This entry was posted on Tuesday, January 3rd, 2017 at 9:07 pm	and is filed under Uncategorized. You can follow any responses to this entry through the RSS 2.0 feed. You can leave a response, or trackback from your own site.